Love, a four letter word that might comprise a thousand (or even million) definitions. We might have been fall in love and could have been gone crazy for it. But how do we cope up and why are we still pursuing love even if we experienced hurt before? They said, 'Love like you've never been hurt' is the exact description of what I am talking about. But beneath those happiness and pain, there are still those memories on how a person broke our heart and left a hole on it. Breakup is such a painful experience; it can lead to depression and doubting yourself. You will also question yourself on what you could have done better and if there is something wrong with yourself. We might have also given them the stars and the moon and sacrificed a lot to a person just to show how much we can offer for love. The worst part of it all is that you have to separate ways and there's nothing you can do about it. The process of healing is not an easy timeline but it will be easier if we know who we should run for in times of heartache. Primarily, God is the best source for an immediate medication to this kind of "condition". 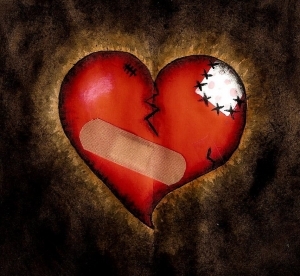 As stated in Psalm 147:3, "He heals the brokenhearted and binds up their wounds". Just come to Him, He will show you the way and there will be a "holy surgery" that He will perform to your heart and be ensure that there will be no pain. Pray to Him and ask for wisdom and greater understanding about His plans. He will build you up and will reveal to you that He has prepared a better person for you. Jesus cares for us (1 Peter 5:7 - Cast all your anxiety on Him because He cares for you) and He wants to take away all those sorrows and pains and stop the tears flowing from our eyes. As we all know, He is the source of everything. He is the only who can provide the greatest strength and comfort that we need in these times of troublesome. Lastly, we can also pray and ask for Him that right person that He has prepared for us. We should be reminded that we should first seek Him and the rest will be give upon us (Matthew 6:33 - But seek first His kingdom and righteousness, and all these things will be given to you as well). The question is, can you commit your time to Him? Study His words and ways and live the way that He used to be while He was here. Keep in our mind that love is the greatest feeling of all and it covers everything.